In most games, the protagonist comes from the mind of its creator – the developer, as it were. Not so with Inked, as here, the playable fella is drawn to life. By Adam, a comic book artist. A character on a piece of paper, and yet… very much alive. Just like his creator. Weird stuff for sure, and to top it off, our nameless hero (the protagonist, not the artist) is on a quest to find his lost love, Aiko. Aww. What stands between him and Aiko? Why, a bunch of puzzles of course! Didn’t you read the title? Well, anyway, puzzles! Brainteasers involving geometrical shapes. Simple stuff, right? Not really. A cube may be just a triangle – so to speak – but the possibilities are endless. Or at least close to. Just look at what happens in the trailer below – that bit with the ramp. Yeah. Different worlds where different parts of the story come together and form a whole. Worlds where you will truly be tested – diving even deeper. Although while puzzles can be fun, the focus is still very much on locating Aiko, reuniting the two, hopefully granting their ever-important ‘forever after’. Chances are it won’t all be bright and cheerful though, as such tales have a tendency to delve into dark territory from time to time. But what’s a love story without a little drama as you go along, exploring this absolutely stunning world? Rubbish, that’s what! 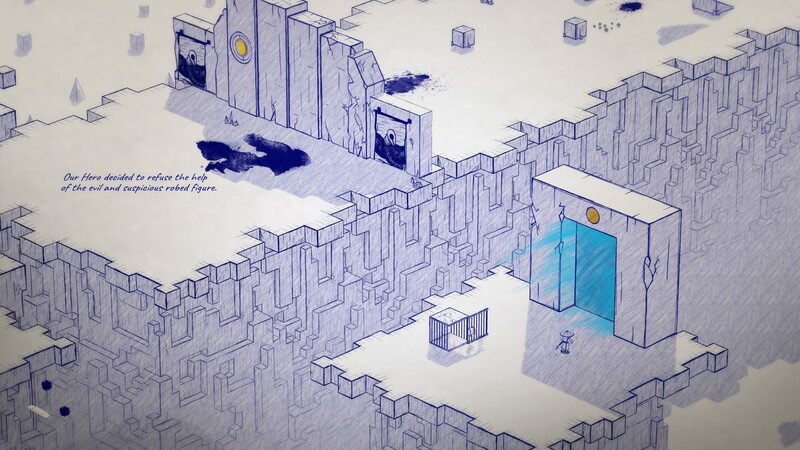 Inked is available on Steam, carrying a $19.99 price tag.